President Pervez Musharraf warned U.S. troops would be regarded as invaders if they crossed into Pakistan to hunt al Qaeda militants and said he would resign if opposition parties tried to impeach him after next month's elections. Musharraf's remarks in an interview with Singapore's The Straits Times published Friday came as police investigated a suicide attack a day earlier in the eastern city of Lahore that killed 24 people, adding to pressures on the former general as he struggles to stay in office eight years after seizing power in military coup. Pakistan is under growing U.S. pressure to crack down on militants in its tribal regions close to the Afghan border. The rugged area has long been considered a likely hiding place for al Qaeda leader Osama bin Laden and his top deputy Ayman al-Zawahri, as well as an operating ground for Taliban militants planning attacks on coalition forces in Afghanistan. The New York Times reported last week that Washington was considering expanding the authority of the Central Intelligence Agency and the military to peruse aggressive covert operations within the tribal regions. Several U.S. presidential candidates have also hinted they would support unilateral action in the area. Musharraf told the Straits Times that U.S. troops would "certainly" be considered invaders if they set foot in the tribal regions. A full transcript of the interview was published on the paper's Web site. "If they come without our permission, that's against the sovereignty of Pakistan. I challenge anybody coming into our mountains," he said in the interview in the garrison city of Rawalpindi. "They would regret that day." Musharraf is also under gathering domestic political pressure. The party of slain opposition leader Benazir Bhutto and the other main opposition grouping are predicted to make gains in the Feb. 18 polls. They have vowed to oust Musharraf if they emerge as winners. Musharraf is seen as vulnerable to impeachment over his decision to fire Supreme Court judges and suspend the constitution last year. "If that (impeachment) happens, let me assure that I'd be leaving office before they would do anything. If they won with this kind of majority and they formed a government that had the intention of doing this, I wouldn't like to stick around," he said. "I would like to quit the scene." "With such bloody violence taking place in Pakistan, there must be questions on security conditions as this country heads towards elections," one Western diplomat told CBS News' Farhan Bokhari on condition of anonymity. Thursday's blast targeting police officers outside the Lahore High Court was the latest in a series of bloody attacks in the country. At least 20 suicide bombers have struck in the past three months, killing 400 people, many of them from the security forces - the most intense period of terror strikes here since Pakistan allied with the U.S. in its war against al Qaeda and other extremist groups in 2001. Lahore police chief investigator Tasaddaq Hussain said the mutilated head of the suicide bomber had been recovered and would be reconstructed for identification. The bomber's other body parts were being examined by forensic experts to extract DNA, he said. "This is an act of terrorism and militants are to be blamed for it," he said Friday. Police said the attacker got into the midst of some 70 officers in riot gear and detonated explosives on his body, spewing shrapnel in a blast that sprawled mangled bodies in pools of blood. All but three of the dead were police officers. "There was a huge bang," said Munrian Bibi, 60, a school cleaner caught in the blast as she headed home from work. "I saw people falling on ground crying for help. I don't know what saved my life from that hell," she said in a hospital where she was treated for leg wounds. There was no claim of responsibility. The government has blamed previous attacks on Islamic radicals allied with al Qaeda and the Taliban sheltering in the tribal regions along the Afghan border. Musharraf blamed the same militants for the Dec. 27 gun and suicide bomb attack that killed Bhutto, a secular former prime minister who had repeatedly pledged to battle Islamic extremism in this country of 160 million people. Bhutto's supporters have questioned whether elements within the government may have had a role in the opposition leader's slaying after a campaign rally, and are demanding an independent U.N. investigation. 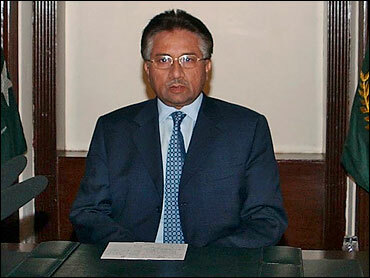 To allay critics, Musharraf last week invited British police to help investigate the attack.